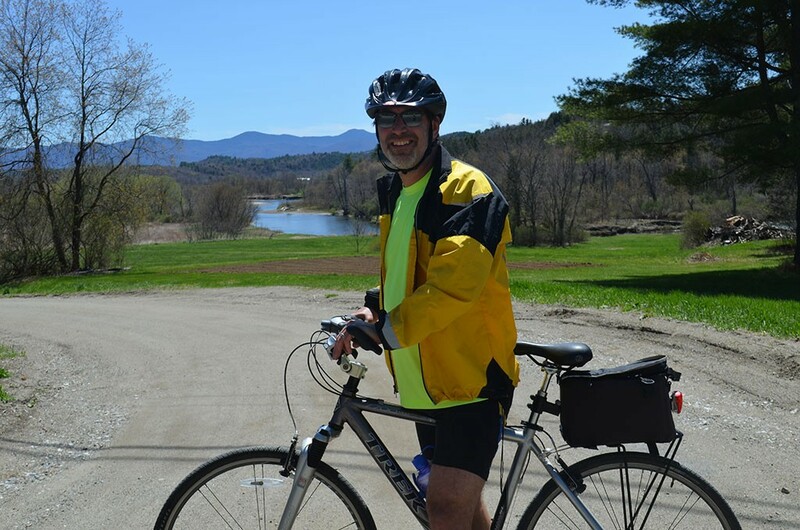 Just before 10:30 a.m., I mounted my bike in Oxbow Park in Morrisville and headed toward the newest section of the Lamoille Valley Rail Trail. Virtually all my previous visits to this small Lamoille County town have been rest stops en route to somewhere else. But the recent completion of a beautiful, 17-mile rail trail, running from Morrisville to Cambridge, is likely to turn the area into a tourist destination on its own. This stretch of trail is just part of the big picture. Last summer, the Vermont Association of Snow Travelers, which is overseeing construction and maintenance of the four-season LVRT, completed the trail's first 12-mile stretch, running from St. Johnsbury to Danville. That and the new section will eventually be two legs of a contiguous 93-mile-long rail trail extending from Swanton to St. Johnsbury. When finished, the LVRT will be the longest rail trail in New England and will provide an economic engine for the 18 towns along its route. While the time frame for completion depends on funding, that engine is already in gear. Before heading out, I stopped at Chuck's Bikes, one of two bicycle shops in downtown Morrisville — the other is Power Play Sports — to get intel on what to look for during my ride. Owner Hank Glowiak reported that this stretch, finished late last year, got plenty of bike use over the winter. That's given his business a big boost, he said, as locals have been stopping by his shop with old "barn bikes" in need of tune-ups and repairs. Aside from the uptick in his own business, Glowiak predicts some sanguine consequences for the whole area. "It should bring down the average weight of Lamoille County," he quipped. "People will live longer." Indeed, as I caught the LVRT on Portland Street, two blocks from the Bijou Cineplex 4, I was struck by how many runners and cyclists were using it on a weekday morning. Though their numbers dwindled the farther I rode from town, it was a promising sign for the trail's future. One bonus of this stretch of the trail is that it has very few road crossings. 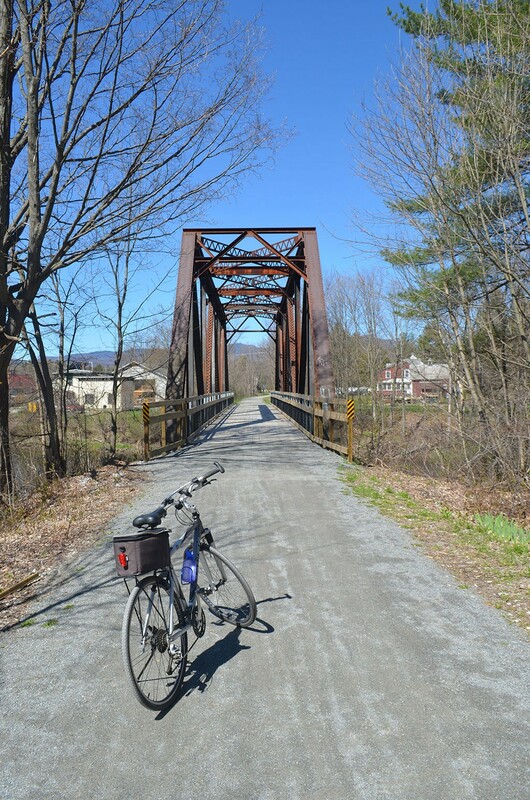 Pedaling west, I rode the packed-gravel path across an old train trestle, then over a new bridge that spans the Route 100 bypass. I passed Lost Nation Brewing, where the outdoor seating for food and drinks was closed on this particular morning. Just as well, as I'd never get far on a belly full of beer. Nearly outside of town, I spotted a signpost directing me to gas (for snowmobiles), food, lodging and bike repairs. Though I expected more signage ahead, I found little. 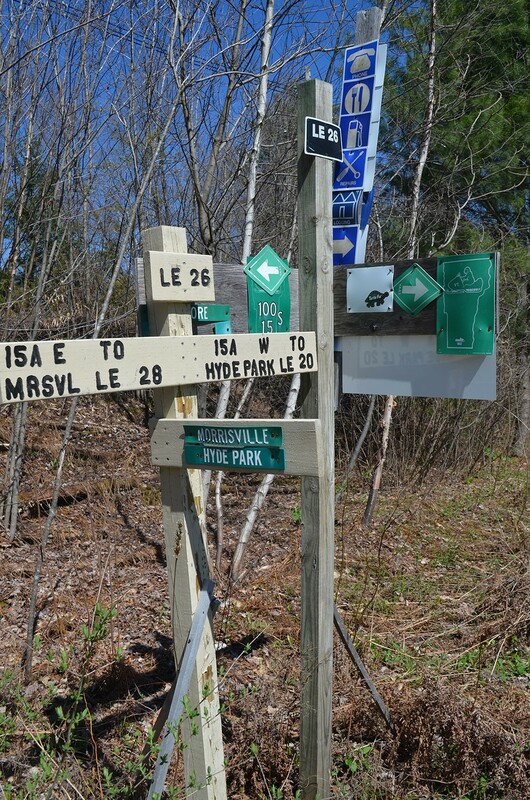 According to Cindy Locke, executive director of VAST, the trail's safety signs are all in place, but amenity and mileage markers are still to come. On May 21, VAST will install a historic marker in Jeffersonville on the spot where three Vermont railroad workers were killed in 1949. Such reminders of the rail trail's industrial past are common on the route, enhancing rather than marring the experience. Entering Hyde Park, the trail follows a gentle bend in the Lamoille River, where I stopped to take in a gorgeous view of the mountains. Looking down the steep embankment, I spotted a pile of rusting debris. Only later did I learn that this wasn't an illegal trash dump but the remains of a decades-old train derailment. A historic marker will eventually tell its story, too. From there, the trail wends through woods, gradually descends to the valley floor and crosses several long, flat stretches of farmland. True to Glowiak's advance warning, I encountered a stiff and steady headwind here. Still, I was relieved not to be riding on Route 15, which is visible from the LVRT but never close enough to leave cyclists sucking exhaust from passing vehicles. Emerging from the flatlands, the trail climbs back into the woods and crosses a second trestle bridge over the Lamoille River. By this point, I was the only cyclist in sight. Farther on, the trail hits another flat stretch, where a farmer was filling an open manure pit. Despite a headwind, I pedaled swiftly past. About a quarter mile beyond the dairy farm, I arrived at a rock ledge and a small jeep trail leading toward the river. I left the trail and parked alongside Dog's Head Falls in Johnson. I'd been warned beforehand about the alluring spot's treacherous currents, which have claimed the lives of several swimmers over the years. But the rocks and river's edge offer plenty of shady spots suitable for picnicking. West of the falls, the trail follows a gentle northerly bend in the river and passes a deeply excavated hillside — a gravel pit used by the town of Johnson for road maintenance. According to an on-site worker, the pit will remain open for only another year or so before it's revegetated. Pedaling west, I savored the full-sensory experience of riding the LVRT — not just its sights and sounds, but also its smells: the earthy, metallic odor of gravel mining; the fecund pungency of freshly fertilized fields; the piney aroma of newly cut timber at Parker & Stearns' lumberyard. The LVRT is less a trip into Vermont's industrial past than a tour of its still-working landscape. And, though the bike path is new, its route is not. First constructed in 1877 by the St. Johnsbury & Lake Champlain Railroad Company, the track served both passenger trains and freight cars hauling timber, limestone, talc and asbestos from northern Vermont's forests and quarries. Passenger service ended in 1956, and the state acquired the right-of-way in 1973, after the railroad went bankrupt. For nearly 20 years, VTrans leased the track to other users, though serious rail traffic dwindled by the mid-1980s. Erosion and flood damage put the tracks entirely out of commission by August 1995. Beginning in 1997, VAST formally began using the right-of-way as a snowmobile trail — a risky venture when snow cover was light, as the rails were still present. In 2005, then-representative Bernie Sanders secured a $4.94 million federal grant to convert the abandoned rail bed into a full-time recreational corridor. Today, the LVRT is a partnership between VAST and VTrans, with volunteer support from the Friends of the Lamoille Valley Rail Trail. VAST still needs another $10 million to complete the project — the next phase will renovate the Sheldon-to-Swanton stretch — and a capital campaign begins next month. Any funds left over after construction and maintenance, Locke noted, will be put toward amenities such as historic signage, picnic tables and composting toilets. "But we've got to get the trail built first," she said. Without signposts to tell me where I was, I overshot downtown Johnson by several miles before checking my smartphone and finding myself halfway to Jeffersonville. Hungry, I backtracked to the lumberyard, then caught Railroad Street into downtown Johnson, where I stopped for lunch at the Dream Café. As I sat down outside to eat, another cyclist pulled up and asked if I'd come across the Notch from Stowe and, if so, whether there was road construction along the way. She was in a foul mood, with good reason. She'd biked from Stowe via Morrisville — but, unlike me, had taken Route 15 and struggled to negotiate the construction and traffic. I informed her that I'd come in on the LVRT; she'd never heard of it. So, after lunch, I invited my new friend, Claudia Rosenholz of Albany, N.Y., to follow me back to the trail. Initially she was wary, not sure the unpaved surface was suitable for her road bike. But once on it, she was thrilled to be there. "Oh, my God! I had no idea this was here!" she exclaimed, with hints of her native Brazilian accent. Rosenholz used to be an avid cyclist with her husband, riding bikeways throughout the United States and Canada. Since his death three years ago, the retiree still visits her second home in Stowe several times a year, but, she said, she has had to find excuses to ride again. Soon it was evident that the LVRT would be one such excuse. We found a comfortable riding pace and enjoyed a steady tailwind through the valley. Rosenholz fell in love with the trail, gushing about it all the way back to Morrisville. Around each new scenic bend she'd exclaim, "Oh, how beautiful!" "This is heaven!" or "Gorgeous, just gorgeous!" I'd already made a new convert to the LVRT, having discovered its pleasures myself just a few hours earlier. Back in Morrisville, we took some selfies on the trestle bridge, then continued another two miles east to the end of the completed portion. (Though the LVRT continues, the next stretch hasn't been resurfaced yet and is best traveled on foot or mountain bike.) Along the way, we spotted an active beaver lodge and lots of dog walkers. Rosenholz and I parted ways downtown, and she continued on to Stowe. I poked my head into 10 Railroad Street, a burger and barbecue joint in Morrisville's historic train station. Outside, meat simmered in a smoker beside picnic tables. Inside the restaurant, which has been an eatery since the 1920s, the very cool railroad décor included historical photos from around the country. Steve Foster, who runs the restaurant, admitted that when construction began on the LVRT, he had no idea what it would mean for business. Since the trail opened, however, his volume of customers has risen dramatically. "The snow-machine community has known about us for years. On a good day, we can have 20 or 30 sleds parked outside," he said. "Now people are realizing, Oh, I can bike in from Johnson, eat lunch, hang out and then bike back." It's easy to envision what the trail will do for this and other communities along the way. I can imagine weekend farmers markets sprouting along the LVRT to serve locals and tourists alike. 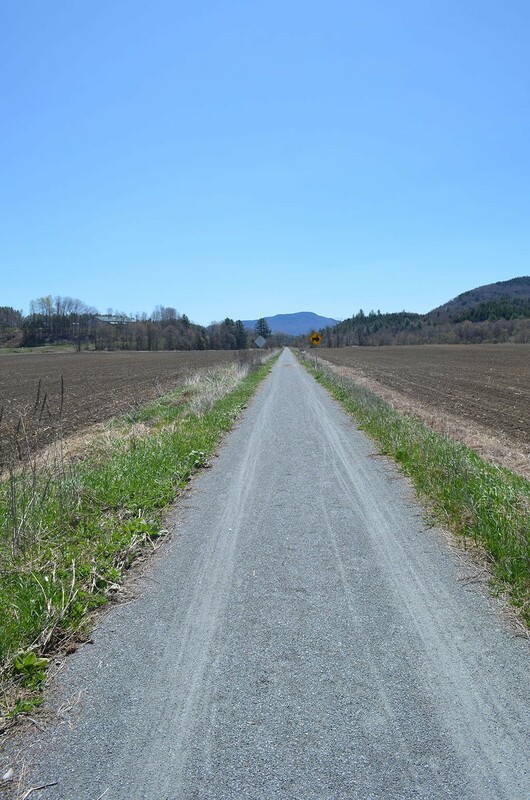 According to Donna Higgons, board president of the all-volunteer Friends of the Lamoille Valley Rail Trail, new businesses such as bike touring companies are already in the works. "This trail is just amazing for all sorts of reasons," said Locke at VAST. "I'm really convinced it's going to be the top four-season recreation destination for the state when it's done." I know of one repeat visitor already. The day after my trip, Rosenholz emailed to say she'd returned to ride the rest of the LVRT to Cambridge. Her one-word review: "Awesome!" The original print version of this article was headlined "Getting in Gear"